7 FOOLPROOF WAYS TO CHOOSE ART FOR YOUR HOME…AND AN ART GIVEAWAY! Let’s talk about the art in our homes! Art is such a subjective subject, isn’t it? We all have a point of view about art! We all are enriched by it and it brings beauty to our homes and our lives. Art strikes chords deep in inside us and evokes so many emotions. The same piece of art can mean many things to many different people. If art is beautiful, emotional, enriching and essential, why is it so hard to choose for our homes? 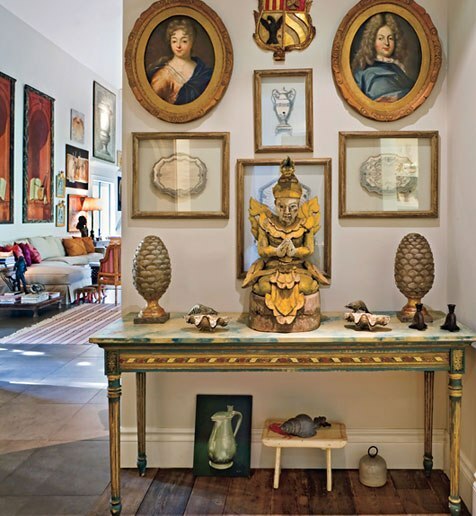 Here are 8 foolproof tips for choosing art for your own home. I’m thrilled to be a part of the bHome community promoting the GIVEAWAY of a beautiful piece of original art estimated at $700.00 CAD! This beautiful, bucolic original painting (not a print… the real thing!) will be given away to one lucky bHome reader! See the bottom of this post to find out how to enter this gorgeous giveaway! If you are like me, you swoon over art too! I have never met an art gallery I do not appreciate! I may not always understand art or love all of it but in general I am a huge fan of art! 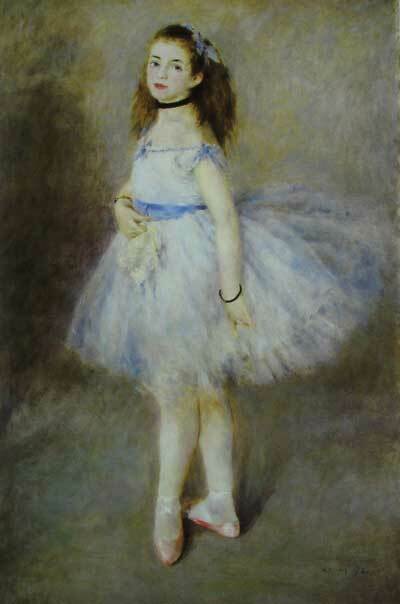 I almost had to be carried out of the Met when I viewed the gorgeous Degas paintings and images there. They spoke volumes to me! I adore Degas and his story and the stories his painting and sculputes tell of the “opera rats”! 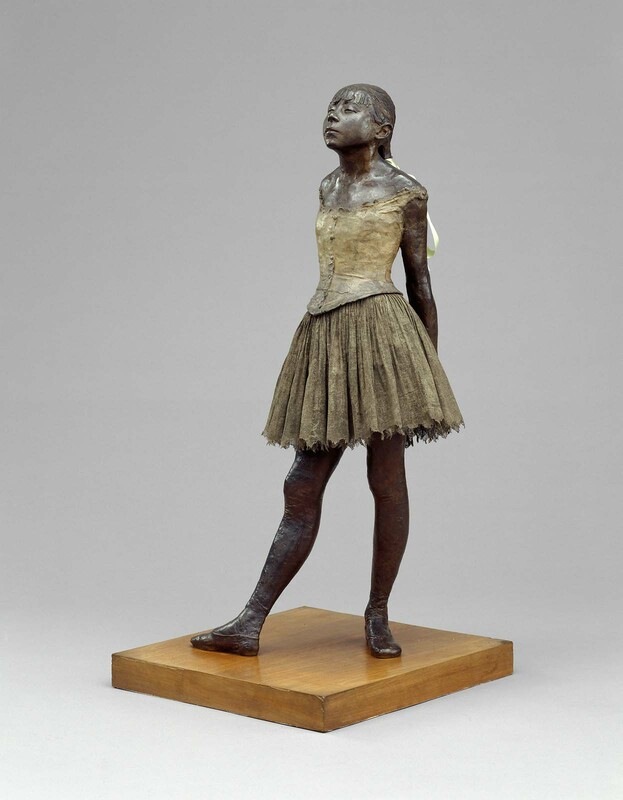 My daughter was about 9 when we viewed (in real bronze life) the sculpture of Degas’ LITTLE DANCE OF FOURTEEN YEARS. It reminded me of the impishness of my own sweet ballerina! I also love how it was first presented to the public in 1881 and the “stir” it made! However I don’t know very much about compiling and collecting art. 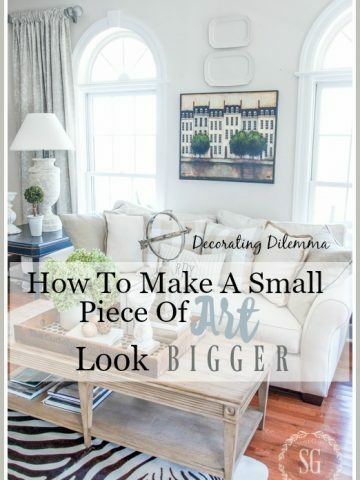 I did do some research and also used my decades of choosing art for my home and came up with some tips that I hope will be very helpful and informative to you who want to find amazing art for your home! ALWAYS COLLECT AND BUY ART YOU LOVE! If all you remember from this post is ALWAYS COLLECT AND BUY ART YOU LOVE you have learned a huge truth! It will help you weed out the okay and help you choose what is fabulous to you! Art speaks to all of us in different ways. You may like all kinds of art, but only buy and use art you love and can’t live without! Do you have art that brings back memories from a favorite place? Or do you fancy one particular artist? Whatever it is about a piece, MAKE SURE YOU LOVE IT! I happen to love (seriously love) the the Americana art of Daniel Kessler and have gifted many of his whimsical art giclee’s by my children. I have a collection in my mud room of cats, dogs, baseballs, the american flag, verses from Genesis and Eastern Market. It’s not just the art or the artist but the memories of being with my kids in Eastern Market on Capital Hill. And yes, I’m crazy about these pictures! This might not be other people’s cup of art tea, but “my home, my art” applies here! Be happy and proud and in love with your art! 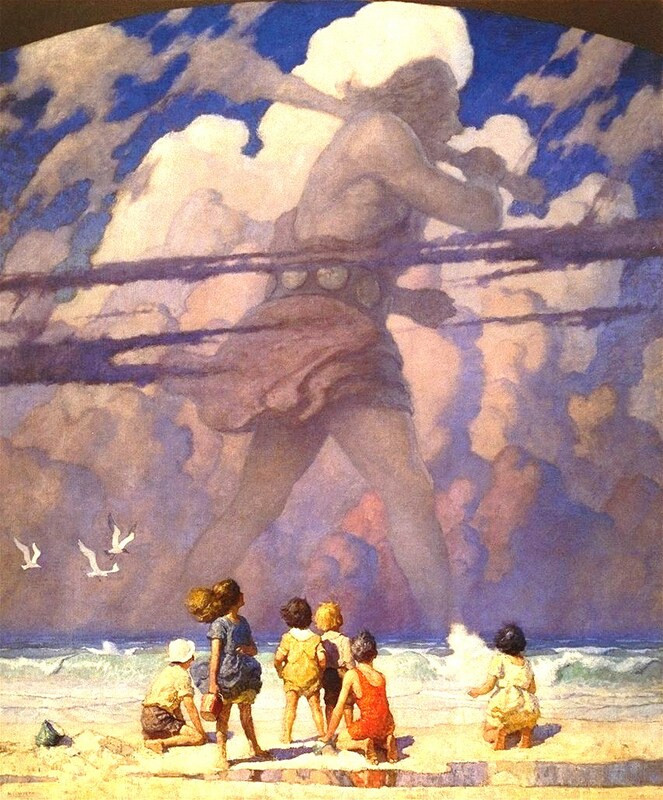 beautiful book illustration and painting done by N.C. Wyeth at the Brandywine River Museum. The best way to develop a love and an eye for art is to visit museums and art galleries. Expand your mind for art that is not know to you. When our children were growing up we made a point to visit art museums in our area and beyond. Bobby and I still love to do that today. Because we live near the Delaware Valley our family has been exposed to the painting of the Wyeth family and their mentor Howard Pyle. I have always loved Maxfield Parrish, also an student of Pyle, and the amazing sky colors he could coax out of a brush. The Wyeth’s use of egg tempra makes my heart beat a little faster! If you ever get to New York the Metropolitan Museum Of Art and the Guggenheim are my favorites museums. I didn’t quite understand the paintings of Picasso at the Guggeheim (and my young son was horrified by the woman with “lots of boobies”) but I do understand his genius! And we have some pretty funny stories to tell! And in Boston, the Gardner Museum is an absolute must… what an experience and what a story! Washington DC has wonderful free museums as part of the Smithsonian. Most major cities have art museums and children’s museums. We have loved and enjoyed museums and art from New York to Texas! Can you guess that Paris and it’s museums are on my bucket list? Don’t overlook local galleries to expand your love of art. They are a wealth of interest and beauty and great art! Many times local artists paint local scenes that tug on our heart strings! It’s also wonderful to support local art! If you love a piece of art connect with the artist by reading about him/her or if you are lucky enough, try to meet them. Know their story and know the story of the art you love. It will make art so more meaningful! The story is almost as spectacular as the art itself. One of my very favorite pieces of art in my home sits above the curlacue chest in my living room. And apparently many of you like it too. Inquiries of the work are one of the most asked questions at StoneGable. This is the first giclee I purchased from Daniel Kessler. We found him at Eastern Market on Capital Hill in Washing DC and it was love at first sight. This painting is responsible for the colors of most of my home. I connected with it immediately! It’s Paris On The Sein and we had a giclee made to fit the wall. If you want to know more about beautiful gilcees click HERE. Meeting Daniel Kessler and speaking to him and listening to the story of how he came to paint these Paris homes was fascinating! I also love Degas. Since I cannot talk to him (he has passed) I have read several books about his life and his works which are extensive! I particularly love his “ballet rats” as Jacqueline studied ballet for 13 years. I do love the colors of Impressionistic art and the amazing group of painters during that age of modern art at its infancy. I know that I may get some push back on this. But I have been in many homes that have amazing art collections throughout them. Art can stand on it’s own not bowing to the style or color or mood of a room. This is a bold move and often let’s me know that I am in the home of a real art lover! I have seen modern art in an Italian Renaissance inspired foyer, a funny cartoon figure in a formal traditional dining room, almost priceless Arthurian sketches on a basement stairway’s wall, children’s framed painting in a bathroom (my kiddos and in their bathroom) and a real Rembrandt in a hole-in-the-wall, but famous, restaurant in Baltimore. I’m in awe of people who are so comfortable with art! I need to take my own advice! In recent years I have taken down much of my art. I get a little bored with it. I love change. So, much of it is in the basement waiting to be resurrected when the whim hit me. Right now I am in my “subway and architectural art” phase! Art has so many mediums. Most of us think of paintings when we think of art. But art can also be drawings, sketches, pottery, ceramics, wood carving, bronze, sculptures, jewelry, polymer clay, textiles, stained glass, blown glass, photography, collage, calligraphy, gold leafing, cartoons and so so much more! Don’t overlook the beauty and wonder of different kinds and styles of art! Let’s not be art snobs! Art can be loved in its original form or in a poster or on a coffee mug! I must concede, that there is something heady about owning a real deal original piece of art. I like to compare it to knowing that you are wearing real diamond earrings when most people could never tell anyway! I love all kinds of art in its many forms. I even have a card from a friend in a small gilded because there was a Degas ballerina on the front of it! 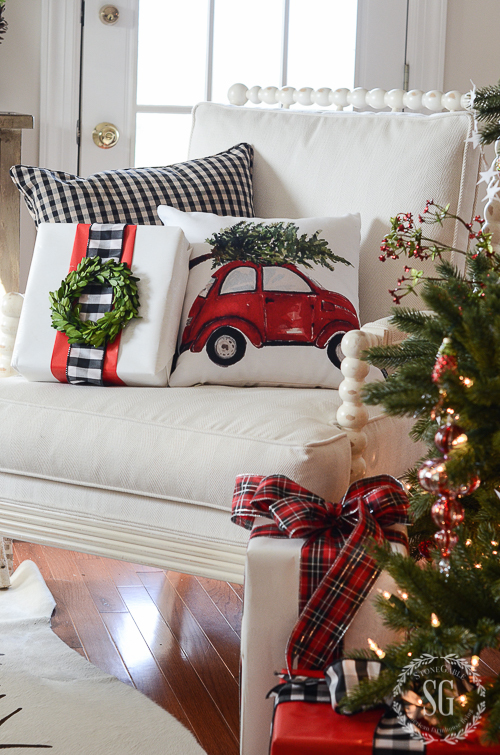 The vw “bug” art on the pillow is from my dear blogging friend Lucy at The Craftberry Bush. This is a tips I live out and love! I’m creative and although I am not a fine artist, by any stretch of the imagination, I can create things to hang on my walls and put on pillows and even use on Christmas ornaments. I fell in love with a modern print I recently saw and almost bought it until I thought, “Oh, I could make that”! So my next project is a BIG piece of original YSPratt modern art! Be bold! Give it a try. Now, I hope you know a little more about choosing, living with and loving art in your own home! And speaking of home… bHome, our home and garden community for smart phone and ipads, is giving you a chance to own a truly beautiful, honest to goodness, real deal piece of original art valued at $700.00 CAD. If you have never heard of bHome or don’t have the app on your phone or ipad HERE’S a little more info. I really hope you will join. Find over 40 of your favorite bloggers (including me) there. And share the whole bHome experience! 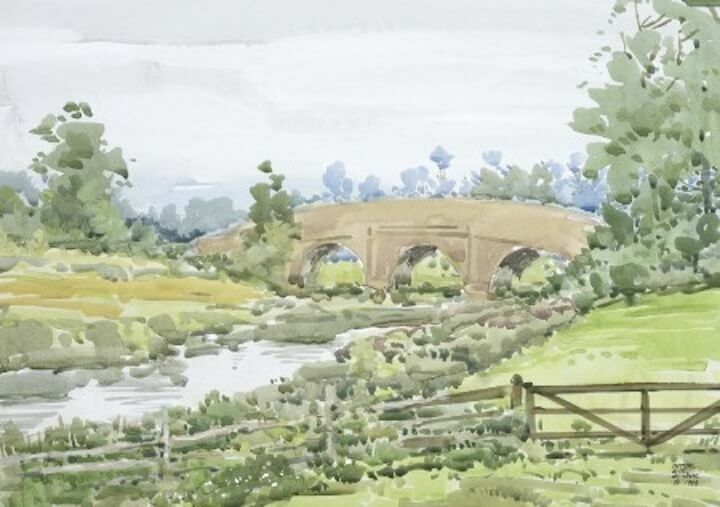 My bHome friend and fabulous home designer Cynthia Webber is donating this giveaway, BRIDGE NEAR BODIAM CASTLE by artist Peter Etril Snyder. Thank you so much Cynthia. I love your designs and your beautiful, historic home Bannock Burn. If you would like a chance win this pastoral painting download the bHome app on your phone or ipad! Browse and find Cynthia’s star and tap it. You will then immediately get a message with a link to enter this giveaway. Just two taps and you are entered! Make sure to tap my star too. That way you will get my newest blog, facebook, pinterest, instagram and more feeds! A huge thank you to Cynthia for such a wonderful opportunity for my readers to own such a fabulous piece of art! Good luck to everyone. Especially, my StoneGable reader! Hi! Your home is so beautiful! The hydrangeas you have pictured in this post are stunning. I have yet to find quality looking faux hydrangeas. Where did you find those?!?! I love the app you direct to for the giveaway. I followed your directions by finding Cynthia, tapping on her, I read her blog post….. what am I missing? Is the something that shows a giveaway or have I done something wrong? Thank you for suggesting the app ? Hi Debbie, Just leave a comment on my blog and that is it! You already did! My grandfather was a professional artist so his works are priceless to me. I love to support working artists because it makes me feel closer to him. Buying art for your home can be a difficult thing to do. You want to make sure it is a good investment as well as it looking good in your home. However, I am glad that you pointed out that you should choose art that you like. 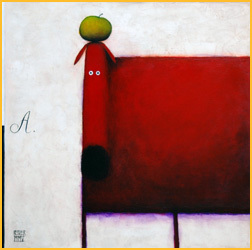 Which seems to be the most important thing when you are buying art. It seems I was severely misunderstood in my comments on your blog. My sincere apology to each of you. Some of you were not too kind to me either, but that is ok. Here in the south we tend to make helpful suggestions. This was my first time to respond to a blog and no doubt my last. As one friend suggested I was not wanted, I ask that you remove my name from your e-mail list. The one thing that I will not do is to take Christopher off my prayer list. I pray for him to have comfort, healing and great success with his surgery. I am an older woman recovering from knee replacement with severe pain. I know the power of prayer. Please accept my apology. I agree with Laura! Get over it! Let’s give Joye some grace, ladies. The internet is not the best way to communicate, and we often “read” more into comments than what was intended and can assume a certain tone was present when, often, it wasn’t….. especially when our admiration for a friend can put us on the defensive. Only Christ was the perfect blend of truth and love when He spoke. The rest of us will always either neglect opportunities to share truth (or opinion in this case), because we are too concerned about coming across as loving, or–as many believe of Joye–be too quick to offer our version of truth without giving enough thought about how to deliver it with love and sensitivity. Let’s not to drive Joye away from this wonderful blog–that blesses us all–by hardening our hearts toward her. Let’s extend forgiveness and move on together. Well put, Laura! Let’s put this aside and give Joye another chance and allow her to join us while we all enjoy Yvonne’s blog. Expressing one’s self in an email can certainly be tricky at times without the addition of facial expressions and tone of voice. I just have to chime in on Joye’s comment, too! Ever sense I read it the other day, I felt so badly for you Yvonne!! You have such a fabulous blog that I read first thing every morning!! Your work so hard, diligently, and blog like no other blogger out there!! What she wrote is referred to as a “peer critique” in design school. I know all too well what it is like to have your work ripped apart piece by piece, but your blog is not the place for this type of criticism. Please know that even though I graduated with a degree in Interior Design, I think you have done an outstanding job decorating Stonegable!! I am tapping on your ★★★★★★★★!!! Thank you for your insights, generous sharing of your home and tips. 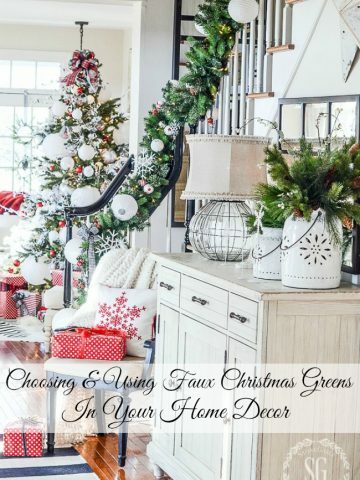 I love the blog article you recently wrote talking about “home envy.” You’re so right … it’s easy to be on the outside looking in and feel the green eyed monster. Many years ago I worked near a very affluent suburb near Chicago – whenever I would go to lunch with my female boss, we would drive through those ritzy streets filled with real mansions and she would say “they’re not happy” pointing to each and every home. I told my mom that story and she laughed and she said to me “don’t you think people walk past your house and say they’re not happy.” Made me realize I have a nice home too. 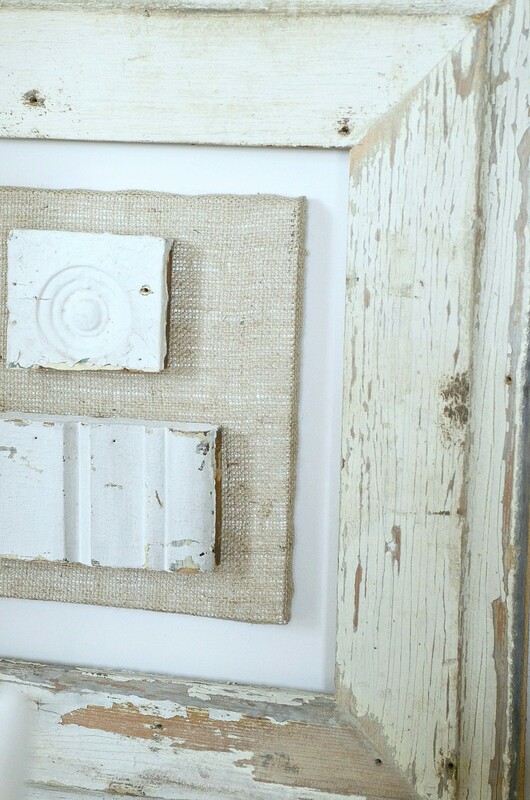 My point is, our homes are what we make of it … whether it’s Goodwill Art, or a DIY, or an original, we’re grateful to have you show us different ways to display and create. I assure you that you have more fans, than those that “hesitate” to offer their constructive criticism. Hi Cindy! You are most welcome! There are so many blogs to choose from…enjoy finding a new one so you can move on. 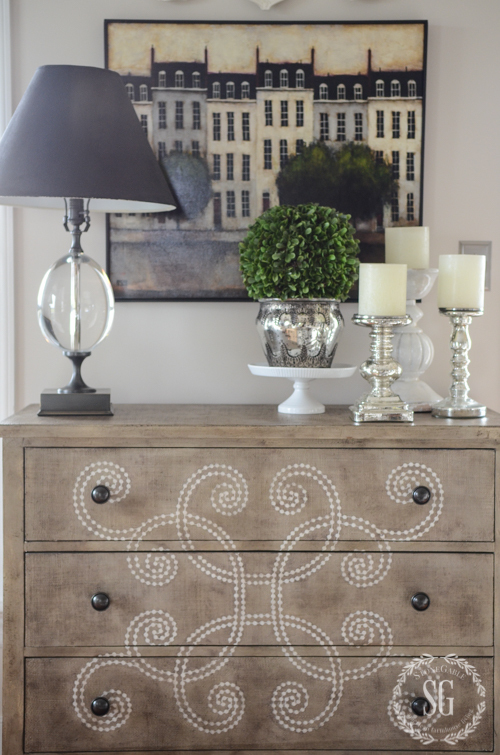 Thank you so very much for your well considered and delightful post about art in the home. When I suggested to Kelly at bHome that I wanted to donate a painting from my collection as part of a series talking about art this was exactly the kind of post I was hoping to see. Your home, ideas and well crafted prose always inspire me… I wish all your readers the best of luck on the painting giveaway. It is my hope that whomever wins it will treasure it for many years. Cynthia, thank you so much for your generous gift and spirit to match! I love that you are part of the bHome family! Hugs! hi Yvonne, this post is so informative, i love art work and i,m very drawn to your Paris houses art. I look forward to your daily posts and have learned so much through your teachings, sharing of your accessories style and vignettes, seasonal tours of your home, i love everything about your blog and all the love, caring,creativity and heart you ( and your handy husband) put into your beautiful home for your family and friends and also by so graciously inviting your readers into your home. I,m very sad that a guest came into your home and forgot to bring “manners” with her and didn,t bother to go back and get them. with much appreciation for all you do. Hi, Yvonne. I followed your instructions, but didn’t get any message or link for the drawing for the painting after starring her on the app. Any suggestions? I’d love to enter the drawing. I enjoy your blog very much. Appreciated your “musings” on art appreciation — it’s a passion of mine as well. Hi Mimi, Are you already a bhome member? If you are find Cynthia’s star and click on it (and mine too please) and send her a message. She should enter you! Good luck! Thanks Yvonne for always welcoming us into your home and heart and soul! I hope the less than nice comment from a less than nice reader doesn’t get to you, but I’ll bet it does, deep down inside. How hurtful that someone can find fault in something, anything from someone who bears their home and heart to us! Joye: We all come here because we like it here! It is a welcome place to rest our otherwise weary minds, hearts and souls. If you don’t feel the same-move along Joye. There are oh, I’m guessing, another million blogs for you to find fault with. There’s isn’t room for you here- we are among friends here. I totally agree with Joanne B.
Yvonne, I thank you for sharing your heart & home. You have a beautiful spirit that encourages so many. I love that you use your God given gifts and thanks to this time we live in with social media so many benefit from it. Thanks for another great post. You are so right….buy what You love! What you cant imagine leaving behind for anyone else. What you want to look at and smile everytime you do so. I find art makes great travel mementoes, too. Would love to enter, but alas, i have no device that lets me download bhome. I have loved that picture of the houses since you hung it over the curlicue buffet. I have a small picture of famous homes in Kansas that is a watercolor a friend gave me. Most of our art are oils that my precious Mother-in-law painted. They are of different subjects, but I would like to figure out a way to do one big gallery wall to honor her. We love the art and could not be separated from it. Great post on art. Lovely painting. Your post is spot on…buy what you love. Yvonne, I love your taste. I am a Pennsylvania primitive artist and years ago when I was first starting out I entered. Local fine county arts council show. I got. Call from the President of the council saying the judges like My work and wanted to give me an award, but they find’ t feel they could give me. Fine arts award… would I be offended if they give me an award in the crafts category instead… I was crestfallen but agreed… So I go tot the awards ceremony and I received the award… not even first place it was for second place. That painting was bought later that year by the son of the world premier folk artist Jack Savitsky and another of my paintings that was in a show in our state museum was in the U.S. Senate in Washington D.C. The same sort of think happened to now famous folk artist Doris Lee. Art is definitely subjective as is decorating. I appreciate you so much as do so many others. Hugs. I love how you are very graciously being silent about all of the “going’s on” and I love it when folks come to the defense of someone they admire so that person doesn’t feel the need to defend themselves….boy, that reminds me of someone else…Christ! Oops, typo in e-mail address. Correcting. I wanted to thank you so very much for all the information you give on your blog. A few months ago I asked where you purchased your chest with the curlicuee on the front. You gave me the information and they have been out of stock. Well, it finally came in and should be delivered the first week of March. I’m so excited. Maybe one day I can have a beautifully decorated home like you. Again, thank you for all you do. So happy for you Vickey! You will love this chest. It’s a work of art in itself! 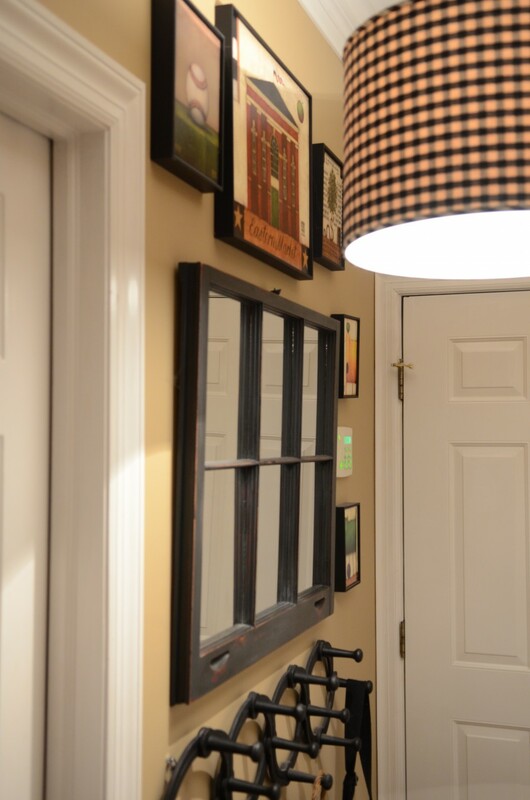 Thanks for this post on choosing art for the home! I love the Paris Houses print. I also have the Andrew Wyeth Giant print, which was made into a poster for the Laguna Beach Pageant of the Masters several years ago. Since I live near the California coast, I started collecting these mostly beach themed posters, and I love them. I need to do a better job of having them framed, though. Dear Yvonne, I am a daily, inspired and appreciative reader who has not commented before, but felt compelled to do so today. I know I speak for countless kind, supportive, like-minded women who are so very grateful for your hard work, passion, boundless creativity and your lovely personal chats with us daily. It is an odd notion to think that any of us drop by to visit with an intent to offer “constructive criticism”. Oh my! Nice matters. Period. We all should have learned that at our mother’s knee and on the playground. Oh my! I could use all of these. So beautiful! Thanks so much. Hi Yvonne I have searched home for Cynthia Webber but cannot find. Can you help. Thanks and I love your home. Joye’s comment was more than mean, and totally inappropriate. With kindness like hers, who needs enemies. It’s a pity her name is Joye, it’s obvious she doesn’t spread any. This was a great post. 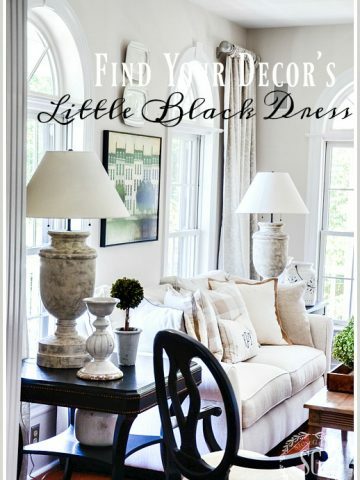 I think that the art that people choose personalizes their homes, and makes them unique. Yvonne, your home is lovely, and so well done. Please don’t let Joyce and her very rude comment ruin your day! Love art in every form! !…great giveaway! This is a wonderful and very helpful post. I recently fell in love with wall art done by a carpenter. It is various types, colors and sizes of wood put together to form a large design. It spoke to me and it makes me smile every time I look at it. However, I am constantly defending my choice of “art” because most of my friends and family just don’t get it because it is not a painting or print. As you said, art is very subjective, and buying what you truly love is an excellent tip! Thank you so much for this today! We all need to love our “art” in our home…It needs to be personal and mean something to us….and never mind what others say….I LOVE your home just the way it is! Period. Thank you for the tips. I have a few beautiful prints that are framed and can move them to different walls in my home for a completely new look. And most of mine were found at very reasonable prices. Example: One large framed Thomas Kinkade (the frame along would have been over $100) I found at a yard sale for $20 dollars! The owner was redecorating and I scooped it up! I don’t have a cell phone or handheld device. I just have to laugh! Joye’s comments (suggestions lol) are ridiculous-but to each their own. You do have some beauties! Love this post. Choosing and displaying art is one of the h hardest things for me to do. Unfortunately, I cannot afford much original art so was glad to see you say prints and posters are fine and needn’t be expensive. Right now, most of the art in my house comes from Goodwill…and I’m ok with that because I really do love the ones I’ve found. I have found several small original watercolors at GW and havelooked up the artists and they are well known in their local areas. 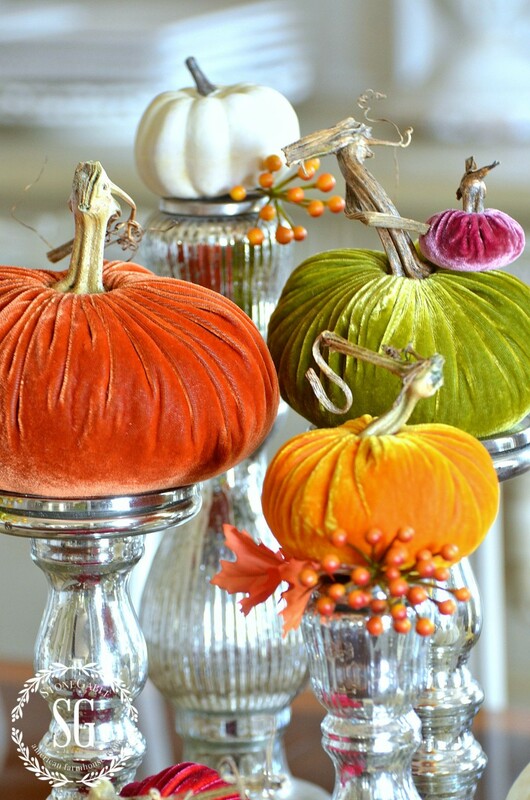 I’m also trying to embrace something else I’ve picked up from you….using other objects as art. I love your white ironstone lids in the dining room. So when found 3 graduated sized silver casserole lids at Goodwill, I snapped them up to hang on my wall. Thanks for all the great tips and advice. Would love to enter, but don’t have an iphone! bHome is for Android phones too and has been for quite a while! I know I created it. Come join us & enter – good luck! I think there is an android version now? Was just about to check to see as I would love a chance to win that beauty:)! I hesitate writing this comment as you might consider it mean. It is just a suggestion. I love the painting over the chest. However, it would show up better without so many accessories in front of it . Also the RH lamp needs a shorter harp or larger shade . The space between the shade and the base of the lamp should never reveal the hardware of the lamp parts. I love the dining room. The space over the buffet is quite long. I liked that you removed one of the lamps. How do you think it would if look if you shortened the height of the shutters to give a variance along the straight line above your buffet, then attached the lids on the front of the shutters ? I know that you do not accept constructive criticism well. But, these are only suggestions and given with kindness. Stone Gable is a beautiful blog and Yvonne graciously shares her home with her readers. It isn’t necessary to offer constructive criticism because it’s her home and she can decorate it however she pleases. She has great taste and style. Wow – I would have to say keep your “suggestions” to yourself. Such a rude thing to do. 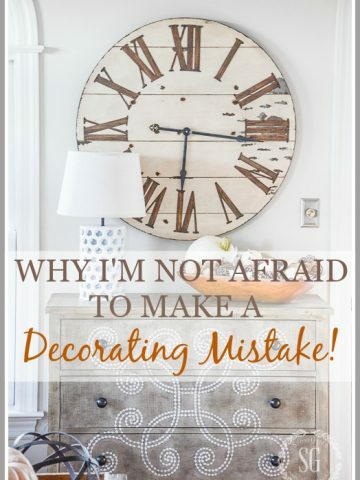 Don’t read the blog if you have such an issue with the décor that she has in her OWN home. Just a suggestion given with kindness, Joye. Joye I don’t believe she is asking for advice…most read her articles because we like her style. If you don’t then instead of being critical maybe you should start your own blog. I disagree that you weren’t trying to be mean, it was a very passive aggressive comment. I just have to laugh! Her remarks (suggestions lol) are so ridiculous.. To each their own. Seriously? I don’t hesitate to say that you ‘didn’t hesitate” in the least, and I’d guess it’s not your first ‘kind suggestion’. Your finishing statement, however, is ‘mean’, ‘quite long’, and ‘should be removed’. i disagree with you and I think your comment is mean.